As we watch political appointments unfold, some of your clients may wish to take more of a “wait and see” approach to their planning, as future tax legislation may seem uncertain. Although they may be reluctant to take action, however, the inability to predict future legislation should not curb your clients’ planning, and this is the opportune time to stress to them the importance of financial planning in uncertain times. From estate planning to retirement income goals, here we’ll cover the basics of helping your clients create a holistic plan that is designed to remain relevant—no matter what the future brings. Every client should have fundamental estate planning documents, regardless of what’s happening on the political scene. Let’s review a few strategies that may help them move forward toward their long-term goals. The POA can be drafted with varying degrees of flexibility, empowering clients to craft a plan that meets their needs while allowing for change in the event of the unexpected. POA for health care matters. This document grants an agent the power to manage the client’s health care needs in a manner consistent with the client’s intentions in the event of incapacity. State legislation may authorize provisions for instructions regarding life support within the health care POA; however, in some states, a separate living will can be drafted to provide for the client’s wishes if the client is unable to make decisions regarding life-sustaining treatment. Trust planning. In years past, revocable trusts with tax planning provisions that funded marital and credit shelter trusts were a common aspect of planning for couples. As the federal estate tax exemption has continued to increase, and with the introduction of portability, some clients may feel that their plans no longer have value. But you and your clients should not remain focused solely on the impact of federal estate taxes. While these taxes have become less of an issue, many states have estate and inheritance taxes at the state level that should be addressed. Encourage your clients to evaluate their trust documents before executing amendments or revoking them entirely. Funding provisions can be put in place, giving the trustee flexibility to work with the surviving spouse. A disclaimer trust provision can also be included to authorize the surviving spouse to examine changes in future values or family structure upon the death of the first spouse, without carving the survivor’s trust rights in stone. Irrevocable gifting strategies. Without a clear and immediate need for estate tax planning, clients may dismiss irrevocable gifting strategies. Although the primary objective of many of these strategies is to reduce the taxable estate, prioritizing non-tax-related goals may help clients see other advantages. For example, an irrevocable life insurance trust can provide wealth replacement, asset and divorce protection, and the ability to control the timing and purpose of distributions. It's important to know that the majority of states have passed Uniform Trust Code legislation that authorizes modifications to trusts for various purposes, bringing some flexibility to “irrevocable” planning. Many have also enacted decanting statutes that authorize a trustee to distribute assets to a new trust. Legislative fixes aside, clients should take care in appointing a trustee and assigning discretionary powers to this trusted individual. Precatory language can be added to the trust document to better guide the trustee and help him or her understand the grantor’s planning goals. 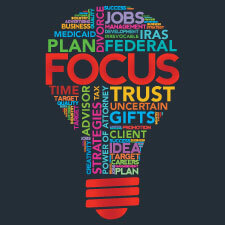 By specifying how and by whom specific powers are exercised, giving an independent trustee broader range, and ensuring that there are provisions for the removal of a trustee when necessary, clients can strengthen the rights of the trust beneficiaries to protect their interest, as well as receive asset protection benefits. Age-related events. Is your client turning 62, 65, 66, or 70½—ages that may trigger social security, Medicare, or other retirement income planning decisions? Expected income influxes. Is your client planning to sell a business? Does he or she have stock option elections or pension decisions to make? Life and disability insurance needs. Purchasing an insurance policy can help with asset protection and tax planning needs. Medicare investment tax and taxes on social security benefits. In addition to traditional retirement plan withdrawal considerations, don’t let these important taxes fall off your clients’ radar. Itemized deduction phase-out limits and alternative minimum tax. Keep an eye out as these costs can affect your clients' retirement income. Charitable contributions. Charitable giving benefits take many forms, including reducing taxable income, providing a retirement income stream, and managing unwanted required minimum distributions from IRAs. With ongoing changes to social security, Medicare, and employer-sponsored retirement plans, setting retirement income goals is more important than ever before. Social security. The Bipartisan Budget Act of 2015 eliminated the popular file-and-suspend claiming strategy for most married couples. Now, choosing the right social security strategy requires evaluating numerous factors, including life expectancy and retirement income needs. For instance, taking a permanent benefit reduction by claiming early may affect the clients’ retirement income goals and the surviving spouse’s financial support. Also, if a client earns delayed retirement credits, the surviving spouse will benefit from an increased survivor benefit amount. Many clients wish to analyze the break-even point—the age at which someone who started taking benefits at age 62 will no longer be collecting a higher lifetime amount than someone who began taking an unreduced benefit at full retirement age. Of course, it’s difficult to predict life expectancy and changes to personal circumstances that may affect retirement income needs. What you can do is line up the pros and cons of each strategy with your client’s retirement income needs and lifestyle goals and find a “comfortable” income stream that meets his or her objectives. Personal health and longevity are unpredictable but important contributing factors. The client’s investing confidence, risk tolerance, and whether the money is needed now will weigh heavily into the decision. The stability of a pension plan may be a big concern, as many companies are buying out their obligations. Next-gen clients. Scaling back benefits seems to be a theme in corporate America, so younger generations need to establish more aggressive savings plans. Now is an opportune time to help them plan for changes to their financial picture that may result from shifts in the political landscape. Keep in mind that these next-gen clients may also find themselves planning for their own retirement and health care costs while at the same time providing financial support to their aging parents. Your clients want to do business with you because they trust your financial planning expertise. As you help them work toward their long-term financial planning goals, encouraging them to stay focused on all of the fundamentals discussed here is a critical piece of the puzzle—especially in times of heightened uncertainty. Have your clients taken a "wait and see" approach in light of the recent political climate? What strategies do you use to prepare for times of uncertainty? Please share your thoughts with us below!